This Bridge is an eight-lane box truss motorway bridge over the Waitemata Harbour, joining St Marys Bay in Auckland with Northcote in the former North Shore City, New Zealand. 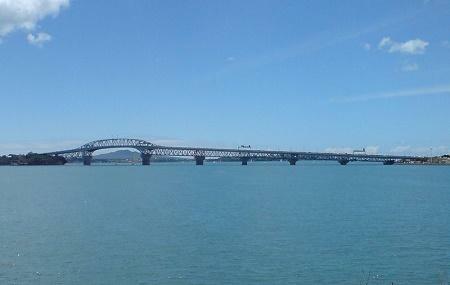 Since 1959, the Auckland Harbour Bridge has been a part of Auckland’s skyline. Considered an iconic structure of New Zealand, the bridge also has private operators operating Bridge Walk tours and Bungee jumping sessions off it. A must visit for the adventurous or the architecturally inclined souls. The Bungee jumping sessions and Bridge Walks happen generally at 9 am. Hiring a taxi is recommended. Eateries present on both sides of the bridge. How popular is Auckland Harbour Bridge? People normally club together Saint Patrick's Cathedral and Sky Tower while planning their visit to Auckland Harbour Bridge. People also prefer to start their day with Auckland Harbour Bridge. You don't visit the harbour bridge because you are not allowed to stop while you're crossing it. You will get the chance to enjoy the scenery when there are plenty of traffic around you to hold you off in a gridlock though. A magnificent work of engineering with the unbeatable views of the beautiful city of Auckland, New Zealand. Simply majestic. I highly recommend climbing the bridge! It is a lot of fun and you get to see the city from the top. There are some narrow spots and a good amount of stairs, but it really is worth it when you finish! We had a 70 year old man with two knee replacements in our group and he was able to climb the bridge with very little difficulty. Beautiful views of the bridge and the harbour. Awesome view of the city skyline as well.